Armalcolite: Mineral information, data and localities. Named in 1970 by A. T. Andersen, T. E. Bunch, Eugene N. Cameron, S. E. Haggery, F. R. Boyd, O. B. James, K. Keil, Marun Prinz, Paul Ramdohr, and A. El Goresy. 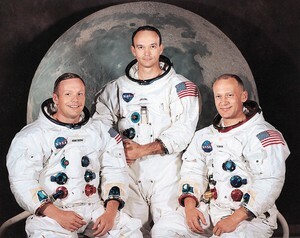 This name is in honor of the first three astronauts who traveled to Earth's Moon. The name is an acronym derived from the last names of Neil Alden ARMstrong (b. 1930, d. 2012), Edwin Eugene ALdrin (b. 1930) and Michael COLlins (b. 1930), the Apollo 11 astronauts who collected the type samples. Graph shows reflectance levels at different wavelengths (in nm). Top of box is 100%. Peak reflectance is 15.2%. Tetraferriphlogopite 2 photos of Armalcolite associated with Tetraferriphlogopite on mindat.org. Sanidine 2 photos of Armalcolite associated with Sanidine on mindat.org. Pseudobrookite 1 photo of Armalcolite associated with Pseudobrookite on mindat.org. Anderson A.T., Bunch T.E, Cameron E.N, Haggerty S.E., Boyd F.R., Finger L.W., James O.B., Keil K., Prinz M., Ramdohr P., El Goresy A. (1970) Armalcolite, a new mineral from the Apollo 11 samples. Geochimica et Cosmochimica Acta: 34: Supplement 1: 55-63. Fleischer, M. (1970) New mineral names. American Mineralogist: 55: 2135-2139. Lind, M.D., Houseley, R.M. (1972) Crystallization studies of lunar igneous rocks: Crystal structure of synthetic armalcolite. Science: 175: 521-523. Haggerty, S.E. (1973) Ortho and para-armalcolite samples in Apollo 17. Nature: 242: 123-125. Lindsley, D.H., Kesson, S.E., Hartzman, M.J., and Cushman, M.K. (1974) The stability of armalcolite: Experimental studies in the system MgO-Fe-Ti-O. Proceedings of the 5th. Lunar Science Conference, Geochimica et Cosmochimica Acta 61, Supplement 1, 521-534. Smyth, J.R. (1974) The crystal chemistry of armalcolite from Apollo 17. Earth and Planetary Science Letters: 24: 262-270. Wechsler, B.A. (1977) Cation distribution and high-temperature crystal chemistry of armalcolite. American Mineralogist: 62: 913-920. Hauck, J. (1981) Crystallography and phase relations of MeO-M2O3-titanium dioxide systems (Me = Fe, Mg, Ni; M = Al, Cr, Fe). Journal of Solid State Chemistry: 36: 52-65. Pedersen, A.K. (1981) Armalcolite-bearing Fe-Ti oxide assemblages in graphite-equilibrated salic volcanic rocks with native iron from Disko, central west Greenland. Contributions to Mineralogy and Petrology: 77: 307-324. Bowles, J.F.W. (1988) Definition and range of composition of naturally occurring minerals with the pseudobrookite structure. American Mineralogist: 73: 1377-1383. Grey, I.E., Li, C., Madsen, I.C. (1994) Phase equilibria and structural studies on the solid solution MgTi2O5-Ti3O5. Journal of Solid State Chemistry: 113: 62-73. Hayob, J.L., Essene, E.J. 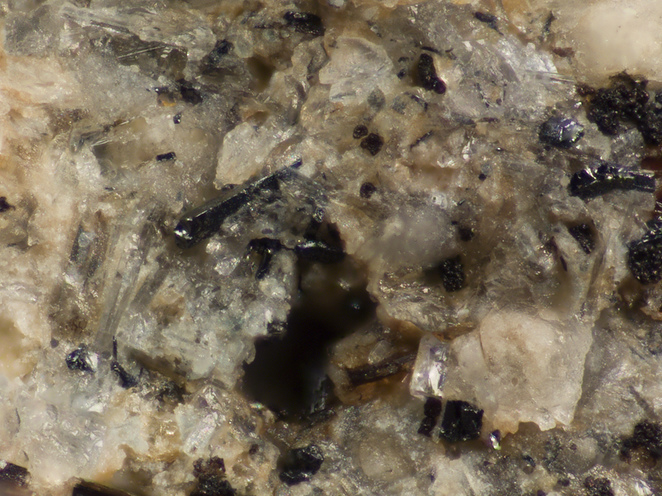 (1995) Armalcolite in crustal paragneiss xenoliths, central Mexico. American Mineralogist: 80: 810-822. Anthony, J.W. et al. (1997) Handbook of Mineralogy, Vol. 3, 22. Yang, H., Hazen, R.M. (1998) Crystal chemistry of cation order-disorder in pseudobrookite-type MgTi2O5. Journal of Solid State Chemistry: 138: 238-244. Tassara, S., González-Jiménez, J. M., Reich, M., Schilling, M. E., Morata, D., Begg, G., ... & Barra, F. (2017). Plume-subduction interaction forms large auriferous provinces. Nature Communications, 8(1), 843. Ikeda, Y. 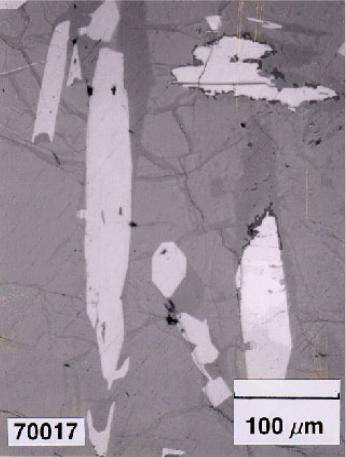 & Prinz, M. (1996) Petrology of silicate inclusions in the Miles IIE iron: Antarctic Meteorite Research. Twentieth Symposium on Antarctic Meteorites, NIPR Symposium No. 9: Editor, Kojima, H. & others: 143-173.; Ebihara, M., Ikeda, Y., & Prinz, M. (1997) Petrology and chemistry of the Miles IIE iron. 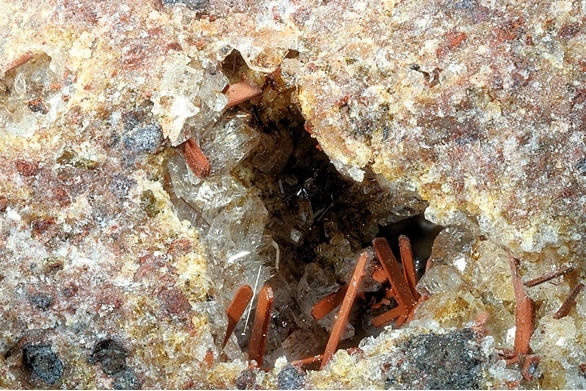 II: Chemical characteristics of the Miles silicate inclusions. Antarctic Meteorite Research. Twenty first Symposium on Antarctic Meteorites, NIPR Symposium No. 10: Editor, Hirasawa, T. : 373-388. Kogarko, L., Kurat, G., & Ntaflos, T. (2001). Carbonate metasomatism of the oceanic mantle beneath Fernando de Noronha Island, Brazil. Contributions to Mineralogy and Petrology, 140(5), 577-587. Roach, T. S., Roeder, P. L., & Hulbert, L. J. (1998). Composition of chromite in the upper chromitite, Muskox layered intrusion, Northwest Territories. The Canadian Mineralogist, 36(1), 117-135. Lin, Y. T. & Kimura, M. (1996). Discovery of Complex Titanium Oxide Associations in a Plagioclase-Olivine Inclusion (POI) in the Ningqiang Carbonaceous Chondrite. Lunar and Planetary Science, vol. 27, pages 755-756. (1996). Kühn, P., Scharmová, M.: Manganový armalcolit a pseudorutil z uranonosných sedimentů severočeské křídové pánve u Stráže pod Ralskem. Bulletin mineralogicko-petrografického oddělení Národního muzea v Praze, 1999, roč. 7, s. 173-176. Contrib. Mineral. Petrol., 122, 174-190 (1995); Grégoire, M., Lorand, J.P., O’Reilly, S.Y., Cottin, J.Y. (2000) Armalcolite-bearing, Ti-rich metasomatic assemblages in harzburgitic xenoliths from the Kerguelen Islands: Implications for the oceanic mantle budget of high-field strength elements. Geochimica et Cosmochimica Acta, 64, 673–694. MCDONALD I., HOLWELL D.A. & ARMITAGE P.E.B. (2005). Geochemistry and mineralogy of the Platreef and ìCritical Zoneî cumulates of the Northern limb of the Bushveld Complex, South Africa: implications for Bushveld stratigraphy and the development of PGE mineralization. Miner. Deposita, 40, 526-549. Prinz, M., Nehru, C. E., Delaney, J. S., Weisberg, M., & Olsen, E. (1983, March). Globular silicate inclusions in IIE irons and Sombrerete: Highly fractionated minimum melts. In Lunar and Planetary Science Conference (Vol. 14, pp. 618-619). ⓘ Knippa Quarry (Whites mines; Texas Traprock quarries; Traprock Hill) ? J. W. Anthony et al. : Handbook of Mineralogy, Vol. 3 (1997), 22; Dowty, E., Keil, K., & Prinz, M. (1974) Igneous rocks from Apollo 16 rake samples. In: Lunar Science Conference, 5th, Houston, Tex., March 18-22, 1974, Proceedings. Volume 2. (A75-39540 19-91) New York, Pergamon Press, Inc., 1974, p. 431-445.
www.union.edu/PUBLIC/GEODEPT/COURSES/petrology/moon_rocks/70017.htm ; Longhi, J., Walker, D., Grove, T. L., Stolper, E. M., & Hays, J. F. (1974) The petrology of the Apollo 17 mare basalts. In: Lunar Science Conference, 5th, Houston, Tex., March 18-22, 1974, Proceedings. Volume 1. (A75-39540 19-91) New York, Pergamon Press, Inc., 1974, p. 447-469.